The Comrades Marathon is an ultramarathon of approximately 89 km (approx. 56 miles) which is run annually in the KwaZulu-Natal Province of South Africa between the cities of Durban and Pietermaritzburg. It is the world’s largest and oldest ultramarathon race. Registrations for the 93rd edition of the race open tomorrow, Friday, September 1 and close on November 30, or when the entry limit of 20,000 runners is reached. The Comrades Marathon 2018 theme is “No Turning Back” which encapsulates the grit, perseverance and determination it takes to complete. 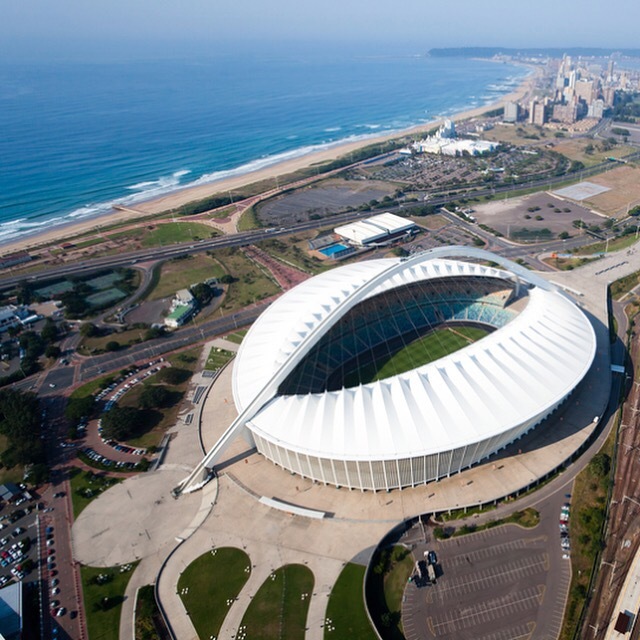 For the first time ever, the race will finish at Durban Moses Mabhida Stadium, host of the 2010 World Cup. This 3.7 mile long sandy beach is by far the greatest attraction in Durban. Swimming is good all year round due to the warm, subtropical climate. Surfing is prevalent, dozens of pools can be found along the esplanade, and crafts can be purchased from seaside stalls. Exotic restaurants, nightclubs, and many hotels can be found beachside. 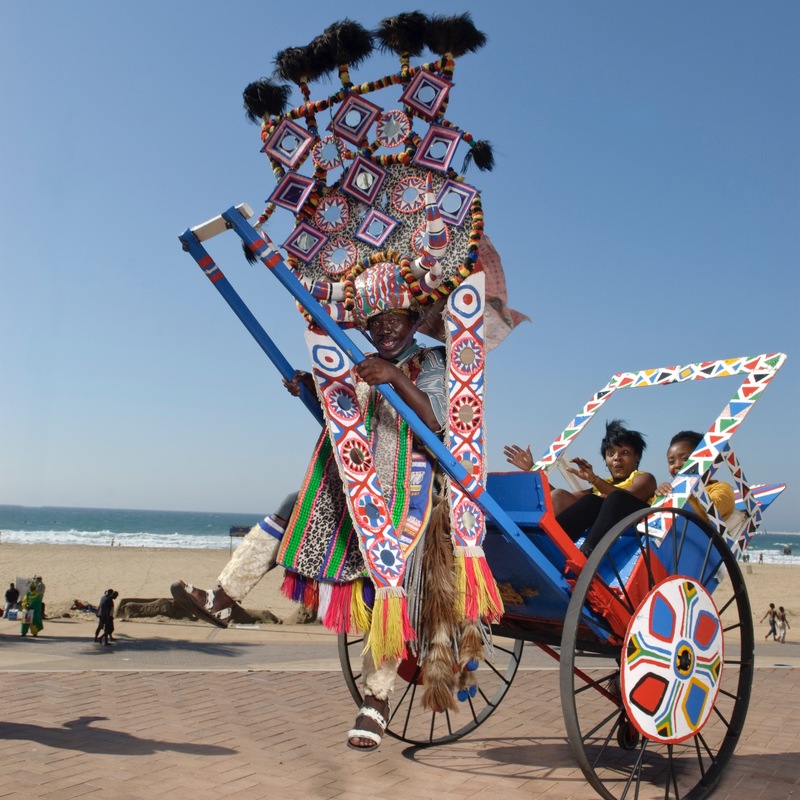 For some of the best views on the beach, visitors can hop on a brightly colored rickshaw and cruise the Golden Mile, Zulu style. Durban is a coastal melting pot influenced by African and Indian cultures and is home to the largest Indian population outside of India. In the Central Business District, visitors can stroll the Victoria Street Market where men in traditional kurtas and women in saris sell spices, curry powders, silk scarves, and more. One of Durban’s top culinary delights is the city’s signature dish of Bunny Chow, Indian curry housed in a hollowed-out loaf of white bread. Located at the end of the Golden Mile, this 40-acre theme park offers water rides, interactive animal shows, a snorkeling lagoon, shark cage diving, a reptile exhibit, shopping, myriad dining options, and more. uShaka Marine World is made up of five distinct sections: uShaka Sea World, uShaka Wet ‘n Wild, uShaka Beach, uShaka Village Walk, and uShaka Kids World. With its iconic “arch of triumph”, Moses Mabhida Stadium is an engineering feat that provides Durban with a defining landmark to match the Eiffel Tower, Sydney’s Opera House, or the London Eye. 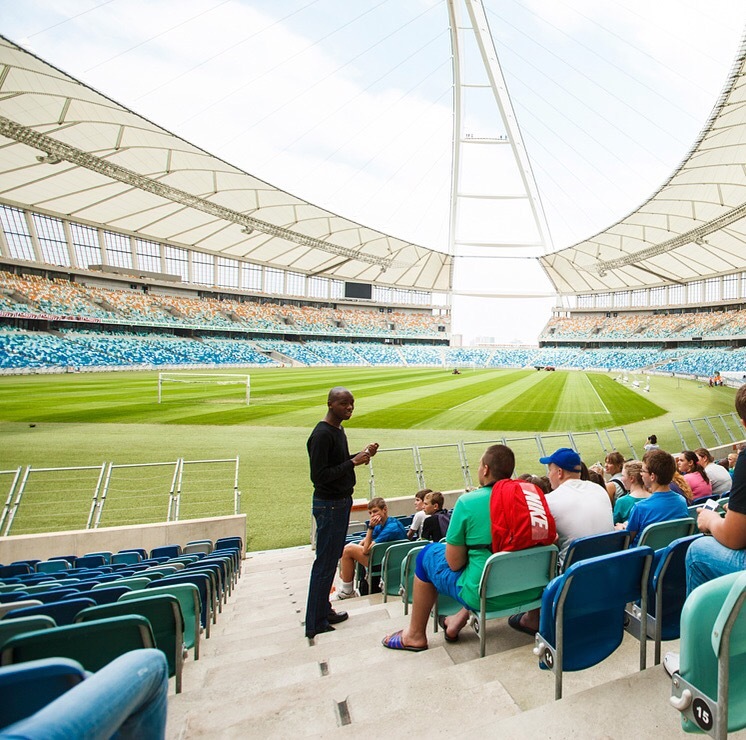 Built in 2009, the 85,000 seat stadium played host to the 2010 World Cup and today is the site of large-scale sporting events, Essence Festival Durban, and six signature activities. These include The Adventure Walk, a 500-step guided climb to the top of the arch, and the Big Rush Big Swing, the Guinness Book of World Records’ tallest swing allowing the adventurous to free fall 772 feet into the stadium bowl while attached to a harness. The Essence Festival returns to Durban September 26 – October 1, 2017. In its second year in South Africa, the festival will again showcase international performers; world-famous speakers; and local artists, chefs, and experts. Just a few of the big names who took part in 2016 included Steve Harvey, Yolanda Adams, and Kelly Price. A sister festival to the long-running New Orleans Essence Festival, the Essence Festival promotes climate of empowerment, inspiration, and entertainment. Florida Road is the heart of Durban’s entertainment scene. The buzz in this shopping, dining, and nightlife district starts in the early morning at the bustling sidewalk cafes and continues throughout the day at a wide range of boutiques, galleries, and more than 30 eateries. Zulu people make up the largest ethnic group of South Africa, with an estimated 10 million residents in KwaZulu-Natal. 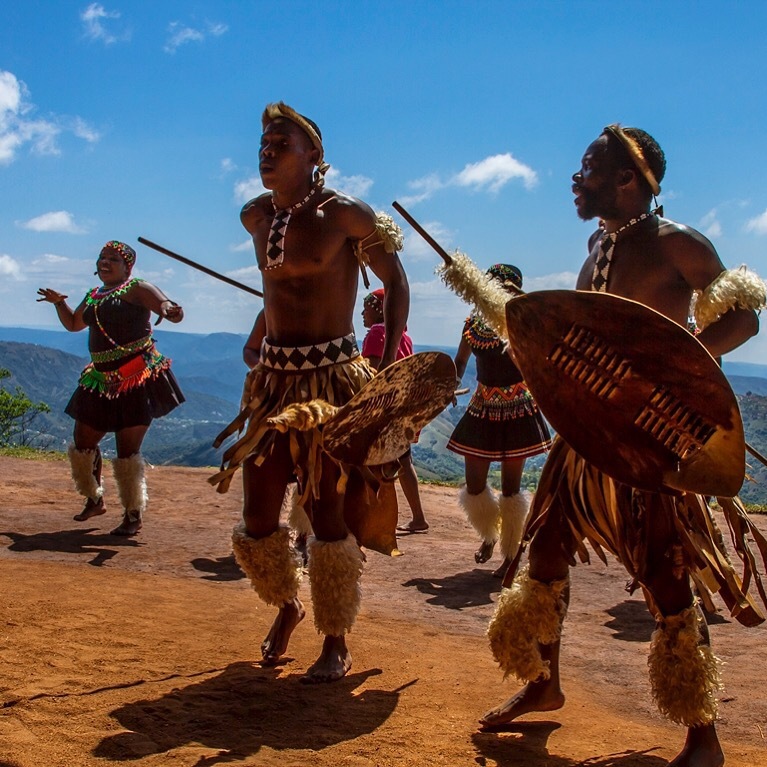 Several opportunities exist to explore Zulu culture in the Durban area including Shakaland and PheZulu Safari Park, which feature replica Zulu homesteads where visitors can participate in traditional ceremonies, learn Zulu customs, try traditional beer, and enjoy energetic Zulu dance performances; and iSithumba, an authentic Zulu village in the Valley of 1000 Hills where visitors can venture into homes and establishments to meet, interact with, and learn from locals. The Inanda Heritage Route includes some of Durban’s most important, albeit little-known, historical sites providing a snapshot of critical moments in South African and Indian history. 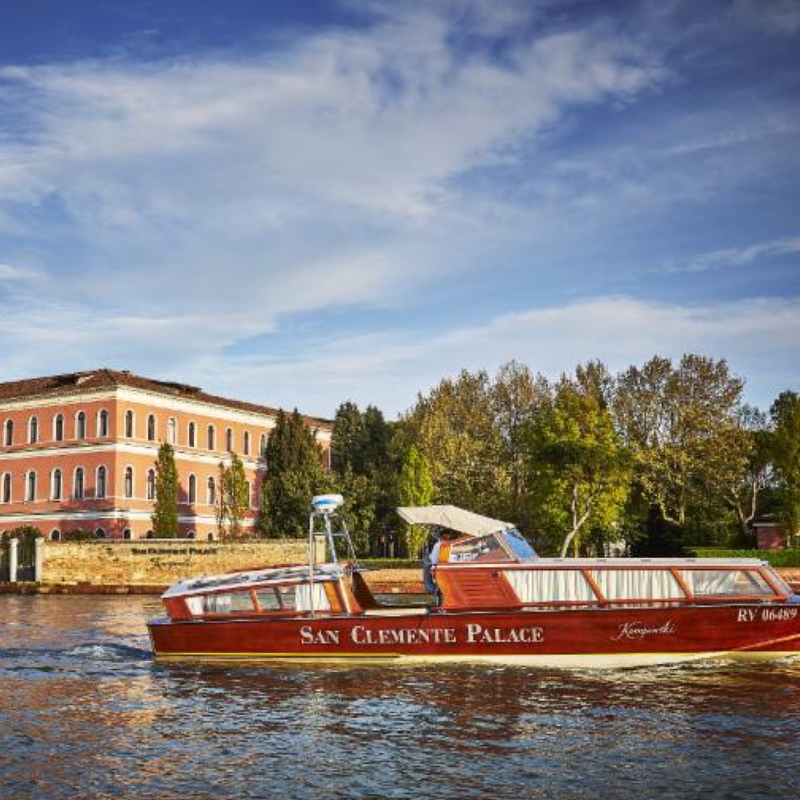 Stops include Mahatma Ghandi’s Phoenix Settlement; the gravesite of Dr. John L. Dube, the first-ever president of the African National Congress; and Inanda Seminary, the first secondary school for African girls. King Shaka International Airport is located just 25 minutes north of Durban’s city center, offering convenient international access and domestic flights to all major South African cities. Durban is the jumping off point to the Zulu Kingdom, and visitors can experience the majestic Drakensberg Mountains, the abundant wildlife of Hluhluwe-iMfolozi Game Park, and the wetland wonders of St. Lucia, by driving just two-and-a-half to three-and-a-half hours outside of the city. Located an hour southeast of Johannesburg by air, Durban is the beachfront gem of KwaZulu-Natal Province (KZN). A bustling harbor city and popular surfing spot, Durban lies on the Indian Ocean and is South Africa’s third largest urban area. Remnants of British colonialism and a mix of Zulu, Indian, and Afrikaans traditions give the city a rich cultural heritage, while outdoor activities abound on the signature “Golden Mile” beachfront and in the lush rolling hills that encompass Durban’s suburbs. For more information, visit www.durbanexperience.co.za. This entry was posted in Travel + Food and tagged 2010 World Cup, 360 Magazine, amusement part, animal shows, beach vacation, Bunny Chow, buzz, Celebrities, Cruise, Diana Macaraeg, Drakensberg Mountains, Durban, Eiffel Tower, entertainment, Essence Festival, exotic, Florida Road, football, Guinness Book of World Records, Hluhluwe-iMfolozi Game Park, inanda heritage route, Kelly Price, kids world, King Shaka, kurtas, KwaZulu-Natal Province, lagoon, London eye, melting pot, Moses Mabhida Stafium, nightclubs, no turning back, PheZulu Safari park, race, reptiles, restaurants, rickshaw, rides, rolling hills, safari, Sea World, Shakaland, shark cage, sister festival, soccer, south africa, sporting events, St. Lucia, Steve Harvey, subtropical, surfingpool, Sydney's opera house, tallest swing, The Comrades, The Golden Mile, theme park, tourism, Ultramarathon, uShaka Marine World, Valley of 1000 Hills, Vaughn Lowery, Victoria Street Market, village walk, visiting, Wet 'n Wild, wetland, Yolanda Adams, Zulu on August 31, 2017 by Pitch360.